The U.S. army has officially ordered its members to halt all usage of Chinese drone manufacturer DJI's unmanned aerial vehicles (UAVs), due to alleged cyber-vulnerability issues. According to a U.S. army memo obtained by sUASnews, both the U.S. Navy and the U.S. Army Research Lab claim that the operational risks of utilizing DJI equipment outweigh their benefits. Apparently, this had been decided as far as one month ago, but kept quiet until recently. The memo makes the orders quite clear. 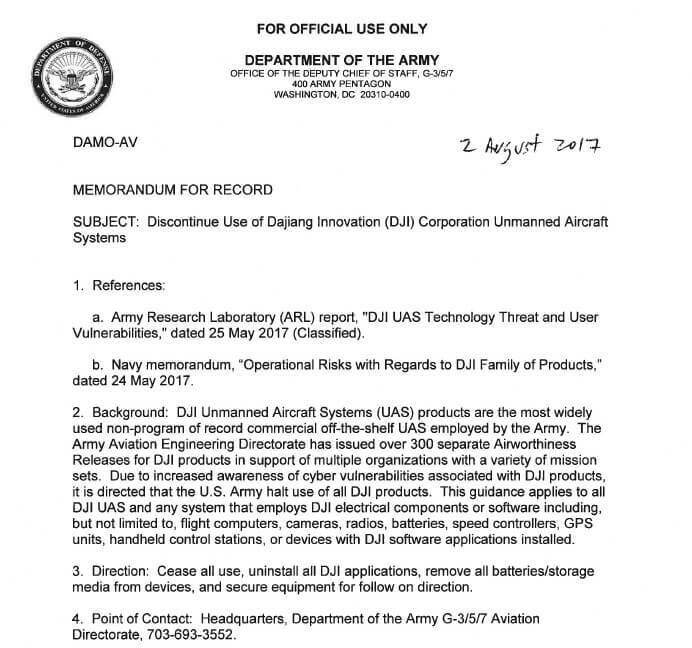 “Due to increased awareness of cyber vulnerabilities associated with DJI products, it is directed that the U.S. Army halt use of all DJI products. This guidance applies to all DJI UAS and any system that employs DJI electrical components or software including, but not limited to, flight computers, cameras, radios, batteries, speed controllers, GPS units, handheld control stations, or devices with DJI software applications installed.” That is a full-on, 360-degree military ban on all things DJI. Whether or not the Shenzhen-based company had been aware of this decision prior to its official announcement is unclear, but they're definitely not happy about it. DJI's Public Relations Manager, Michael Perry, told sUASnews that DJI is "surprised and disappointed to read reports of the U.S. Army’s unprompted restriction on DJI drones as we were not consulted during their decision. We are happy to work directly with any organization, including the U.S. Army, that has concerns about our management of cyber issues. We’ll be reaching out to the U.S. Army to confirm the memo and to understand what is specifically meant by ‘cyber vulnerabilities’." A spokesman for DJI told the BBC that the company does "not market our products for military customers, and if military members choose to buy and use our products as the best way to accomplish their tasks, we have no way of knowing who they are or what they do with them. The US Army has not explained why it suddenly banned the use of DJI drones and components, what 'cyber-vulnerabilities' it is concerned about, or whether it has also excluded drones made by other manufacturers." Of course, drones are prohibited from flying anywhere near military bases (more specifically, within 400 feet of the known 133 U.S. military bases), but this seems to be pointing to something far more delicate and sophisticated—the fear of foreign states from obtaining visual and geographical data and information of the U.S. military's endeavors. If an intentionally placed piece of code where to be implemented into all Chinese-manufactured DJI drones, and those were capturing data regarding the military's whereabouts and activities, this could be of considerable fear to some within the U.S. army. How plausible or ridiculous that fear is, is best left to professionals. For now, it seems like DJI has a problem, regardless of them being the leading drone manufacturer of UAVs in the U.S. How badly does this damage their reputation? Will this lead private hobby users from jumping ship? Is this all fear-based hogwash? Chime in below with your thoughts.